In this important new book a remarkable group of authors - academics, journalists and politicians - offer a radical reappraisal of the future of Left political theory and policy in the context of recent changes in society. Compiled by the Institute for Public Policy Research, the volume includes contributons by Anthony Giddens, Perry Anderson, Gordon Brown, Anne Phillips, Michel Rocart, David Marquand and Will Hutton among others and sets out many new ideas and concepts. David Miliband is Head of Policy in the Office of the Leader of the Oposition. He is co-editor of Paying for Inequality: The Economic Costs of Social Injustice (1994). Part I: The Context: Understanding the Present: . 1. Brave New World: The New Context for Politics: Anthony Giddens. Comment: Power, Politics and the Enlightenment: Perry Anderson. Part II: Citizenship, Equality and Democracy: . 2. Inequalities of Power, Problems of Democracy: David Held. Comment: Deciding About Rights: Anna Coote. 3. Equality, Difference and Democracy: Elizabeth Meehan. Comment: Citizenship and Political Change: Raymond Plant. 4. Ethnic Difference and Racial Equality: New Challenges for the Left: Tariq Modood. Comment: Minority Rights, Majority Values: Bhikhu Parekh. Part III: Social Solidarity and Economic Prosperity: . 5. The Politics of Potential: A New Agenda for Labour: Gordon Brown. Comment : Whose Community? Which Individuals? : Anne Phillips. 6. Productive Solidarities: Economic Strategy and Left Politics: Joel Rogers and Wolfgang Streeck. Comment: Don't Forget the Demand Side: Robert Kuttner. 7. Social Solidarity in a Mixed Economy: Michel Rocard. Comment: The Social Market in a Global Context: Will Hutton. Part IV: Politics Beyond Labour: . 8. Equality and Work in the Post-industrial Life-cycle: Gosta Esping-Andersen. Comment: Economic Imperatives and Social Reform: Frances Fox-Piven. 9. Sustaining Social Democracy: The Politics of the Environment: Stephen Tindale. Comment: Sustainability and Environmental Policy: Five Fundamental Questions: Susan Owens. Part V: Instruments of Change:. 10. Reinventing Federalism: Europe and the Left: David Marquand. Comment: European Constitutional Patriotism: Jos de Beus. 11. Reinventing Politics: Manuel Escudero. Comment: Turning Outwards - Towards a New Sort of Party: Margaret Hodge. 12. Do's and Don'ts for Social Democrats: James Cornford and Patricia Hewitt. * This volume is the product of a remarkable group of authors - academics, journalists and politicians. 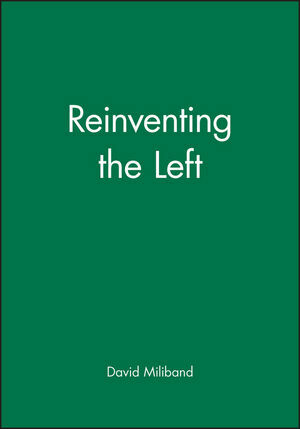 * The authors offer a radical reappraisal of the future of Left political theory and policy in the context of the fundamental changes that society has undergone over the last two or more decades. Many new ideas and concepts are set out. * The unique importance of this book has to be understood against the failures of Conservative rule; the clear limitations of New Right thinking, the political vacuum that pervades British politics today and the general failure to embrace - often for very good reasons - Left alternatives. The book offers both original analyses and timely new prescriptions. * This volume was organized by the IPPR in London, and will receive extensive media coverage.